Metro Style Apps are a new style of apps introduced by Microsoft. Metro Apps can run on Windows 8 and future versions of Windows 8. Metro Apps are different from traditional programs in various ways. Some of the differences between Metro Apps and traditional apps are explained below. Metro Apps by default have no minimize, maximize, resize and close buttons. No built-in menu like other normal apps. It will have a single, chromeless window which occupies the full screen, allowing users to work with the application without any distractions. The Metro Style Apps can have multiple views across multiple form factors, display sizes and devices. By nature, Metro Apps can adjust itself to various displays without writing any special coding for each devices and form factors. In case of traditional apps, you will have to write a lot of code for the application to adapt to different displays. Metro Style Apps can respond to various touch gestures including multi-touch. They are designed for touch based devices but it can work well with other traditional inputs like pen, mouse and keyboards. The Metro Style Apps do not have to depend on any common channels like Oeprating System to exchange data. With the traditional apps, they have to use various OS level resources like file system, message queue etc to exchange data between applications. With Metro Apps, they can talk to each other and exchange data, search across apps and provide a better user experience. We are all familiar with the application icons in Windows. We see it everywhere in Windows. When we install a new application, we will get a new icon in our desktop. The Metro Style Apps use "Tiles" instead of icons. Tiles are another type of rectangular icons shown in the Metro Desktop in Windows 8. The Tiles can do a lot better than traditional icons. The old icons are just a shortcut to the application. Other than changing the image in the icon and starting the application, the Icons can do nothing more. The Tiles have a lot of functionality associated with it. 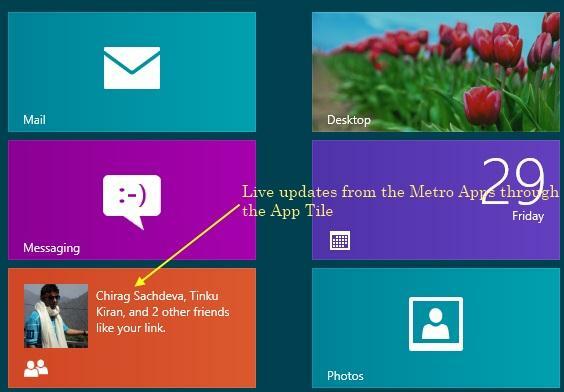 When the Metro App is not actively running, it can still provide some updates to the user through the Tiles. For example, an email app can keep showing latest email notifications through the Tile when the app is not actively running. The Metro Apps are not expected to have its own custom menu and commands. Instead, they all will use a standard command bar called "App Bar". The App bar appears in the bottom of the app, covering some portion of it. It is activated only when the user swipe with a finger on the app and it can be dismissed with another app. Metro Apps will present commands, controls and tools to the users through the command bar. The command bar will have the same and consistent look across all the apps. The Charms Bar is another command bar shared across all apps and programs in Windows 8. The Charms Bar similar to the task bar in Windows. They exist whether an app is running or not and provides access to certain common functions like Search, Settings, Configuration etc. When the Charms Bar is activated in the context of an active Metro App, the Charms bar will provide settings and data in the context of the currently active application. Traditional Windows programs will not be able to make use of the App bar and command bar directly. Well explained, got the detail and difference between Metro Style Apps and traditional Windows Programs. Good work.